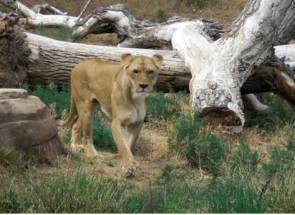 The American Lion is thought to be the largest cat that ever lived! Also known as Felis Atrox, it is a relative of the African Lion (Panthera leo) and maybe a subspecies. The name Panthera means “Panther”, (Leo) “Lion”, and Atrox “frightful”; so- “Frightful Panther or Lion”. Even though this Prehistoric Predator is a close relative to the modern Lion; genetically, it is closer linked to the extinct Eurasian Cave Lion. While Cave Lions lived in Europe during the Pleistocene Period, the American Lion lived in North America and as far south as Peru. 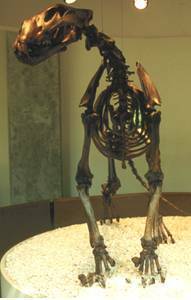 This gave it a sometimes name of “North American Cave Lion” or “North American Lion”. This giant of all cats was larger than an African Lion, 5 feet (1.7M) tall and 11.5 feet (3.5M) in length from nose to tail and weighing about 700-800 lbs. It ranged from Alaska to the middle of South America. In North America, this Ice Age Cat dated as far back as 350,000 years ago, and went extinct about 13,000 years ago. And in Florida, this Ancient Lion arrived around 70,000 years ago in the late Pleistocene Period and is considered extremely rare. They seemed to have been distributed in Northern Florida and not in Southern Florida. A complete skull with lower jaws was discovered in Columbia County, Florida. 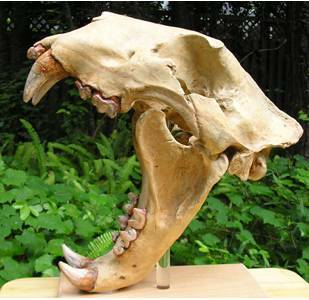 It is more uncommon than Smilodon fossils here and the bones are much larger. This Extinct Prehistoric Cat had a muscularly built body with longer legs and even more powerful front legs than an African Lion; and was probably faster. This faster speed may have helped in catching faster prey animals. It had 4 inch plus canine teeth. This Top Ice Age Predator had an estimated bite force of 1800 lbs. per square inch. That is twice the bite force of today's modern lion. The Male had no mane, like its Cave Lion cousin; based on cave paintings, in France, made 30,000 years ago. Over a hundred specimens of Panthera Atrox have been collected in the La Brea Tar Pits of Los Angeles, California. It, also, had the largest brain to body size of any lions known. Was it smarter than today’s Modern Lion? Some considered this big prehistoric cat mainly an ambush hunter and others a long distance runner in open country; so the debate continues. With razor sharp claws, this prehistoric predator hunted big animals like ancient Bison , Horse, Giant Ground Sloth, Juvenile Mammoth, Camels, Deer, and Tapir. Panthera atrox was a competing predator with Saber-Tooth Cats and the Giant Short-Faced Bear. 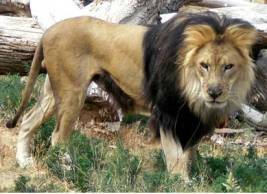 With maybe the exception of Paleo-Man; the Prehistoric Lion had no recognized predator. Panthera atrox's fate seems to be tied-up with its large animal prey. When they went extinct, so did most of the big prehistoric cats.